Discussion in 'Nikon' started by pablo ledesma, Dec 18, 2004.
err... "woodgrain patterns in this can that Newton effect?" should read; woodgrain patterns in this scan that "Newton effect"? Yes, those are Newton's rings. Anti-newton glass may cause a granular pattern in the scanned file which is even worse than rings. If you cannot ensure flatness without glass, you may want to try a fluid which matches the refractive index of the glass. Which scanner are you using? coudl try manual focussing? (depends on how good your scanner is I guess). combine the results? Anyway, the short answer is 'Yes' it is that 'Newton effect'. I get Newton's Rings with a glass carrier in a Nikon LS-8000, despite having anti-Newton glass. They result from interference patterns generated between two reflective surfaces in close proximity (not from water droplets). 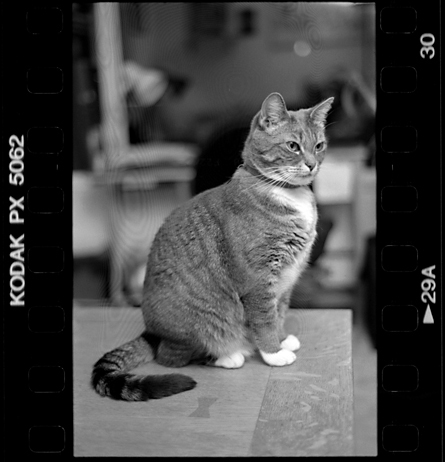 Since I scan only 6x6, I placed one of the self-adhesive strips in the Nikon kit on the upper glass, between the first and second frame of the film strip, to increase the spacing. This eliminated the Newton Ring formation. You could use a strip of self-adhesive label to do the same. You might want to cut a mask from black craft paper or matting board to locate the film, and hinge the cover glass to the mask. That works pretty well with my Epson 2450. The lower, emulsion side of the film is less reflective, and usually curled away from the glass, and is less likely to form Newton's Rings. like an epson flatbed that has no focus adjustment and relies on depth of field. designed to be dusted on the glass surface and prevent newton rings.